When I'm now analyzing my galaxy observations from the past weekend, I found to my joy that I had observed a member to the galaxy cluster Abell 1738 in Ursa Major. It is situated 2º.7 N of Mizar in the Big Dipper. I had seen the galaxy MCG+10-19-68 (=PGC46931) in the centre of Abell 1738. I saw the cluster symbol on my chart but I was not sure if the galaxy belonged to the cluster. NED verified the membership and gives the magnitude as 16.58 (B-mag?) but APASS gives the visual magnitude as V=15.64. MegaStar gives the size as 0'.5x0'.4 but NED says 0'.2x0'.13. I wrote during my observation with my 12-inch Dob and 214x magnification that PGC46931 was "very faint, pretty small and had a low surface brightness". The galaxy's redshift is z=0.1154 and radial velocity +34599 km/s. NED gives the distance as 476 Mpc, 1.55 billion light-years. It is the most remote galaxy I have ever seen, more distant than even the galaxies in the famous Abell 2065 in Corona Borealis! I could not see the neighbour MCG+10-19-69. I have so far seen 20 Abell galaxy clusters. During the last two weeks, I had observed 146 new galaxies with the 12-inch and I had never seen so many new galaxies during a new moon period! I had also logged my 111th galaxy in the Coma cluster, Abell 1656. That was the last chance of darkness before our bright summer nights here at latitude 60º N.
Edited by timokarhula, 25 April 2018 - 05:35 AM. Extraordinary observation. I am in awe of your skill. Edited by Astro-Master, 25 April 2018 - 09:04 PM. IC1101 has the visual magnitude 13.7 and size 1'.1x0'.6 so it should not pose any problem to 12-inch aperture. I wonder if MCG+10-19-68 is the most distant galaxy brighter than 15.5-16.0 magnitude? It is somewhat brighter than M87 abolutely, about magnitude -22.8. If IC1101 would be placed at the distance 1.55 billion light-years, it would still shine at about 14.5 magnitude. So, I wonder if there any more monster galaxies out there at > 1.5 Gly distance? Timokarhula ( Dig that name ), Superb achievement, great report. There is another massive galaxy at the heart of Abell 1413: PGC 37477. It is rather conveniently found just beyond the end of a string of stars running WSW from 7.7 mag star HD104590 (itself a short jump WSW of 4 com). At z~.141 and a (red, I believe) mag 14.4, maybe too faint for 12" but it sits within a pair of unequally loose star pairs, so you'll know where to look. I spent some time reviewing Abell clusters and that is the best Brightest Cluster Galaxy I could find for z>.1 It was direct in 25" though dim, being a "red and dead" early type giant elliptical. IC1101 should be a sure bet for you anyway, though rather late to culminate. Edited by quazy4quasars, 26 April 2018 - 01:13 PM. PGC37477 (MCG+04-28-097) is a good candidate! SDSS gives the R-magnitude as 14.58 and G-magnitude as 15.71. With a good approximation is V-magnitude the mean value of these, V=15.14. That may be well within reach for a 12-inch. The galaxy does not look that faint on the Digitized Sky Survey. I'll have to wait until next spring to be sure. I attempted to do some image comparisons using Pan-Starrs image archives but the link I have used before isn't working anymore, and my attempts to use their current image server return a DNS error. The data is now available through the Barbara H Mikulski Archives but even there I can't seem to access it. I prefer to use Pan STARRS because there one can see the u, g, r, i, z plates individually and get a better idea of the brightness and appearance of galaxies etc than with SDSS (which applies color mapping to bring all five bands into the visual palette and can't be viewed separately). I have a broken foot so I'll have to wait a while to get another look at any of these objects through my big scopes. Some many galaxy clusters that I did not know exist. I like to check them out. They could make good video astronomy targets. Edited by Ptarmigan, 02 May 2018 - 11:33 PM. This thread had me curious about the most distant (normal) galaxy or cluster that I've observed through Jimi Lowrey's 48-inch in west Texas. The galaxy cluster WHL J123647.1+255131 is located 10' SE of the center of NGC 4565 and only 4' beyond the SE end of the galaxy! I've sketched and verified 4 members in the cluster with a V magnitude of 17.7 to 18.0. The cluster has a redshift of z = .182 and a light-travel time of 2.2 billion years. The WHL designation is from the 2009 paper "Galaxy Clusters Identified from the SDSS DR6 and Their Properties"
But we've never looked for giant cD galaxies with a redshift greater than z = .20. That would be a fun project! Steve, allow me to suggest 2MASX J17222717+3207571, which is at the core of Abell 2261. This is at z~.22 and it is shown at g=16.8 and r = 15.3, for a probable V~16.0. I think it may yield a detection due to its fairly bright core. At z>2, the issue is that the maximum optical emission is well red-wards of the scotopic sensitivity peak. I might ask if you will be attending the SFSU field astronomy class at Packer Saddle this year? That would be an excellent opportunity. 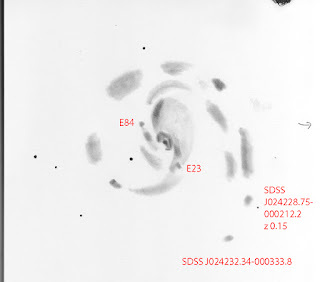 I just noticed, looking at images of this beast (2MASX J17222717+3207571) on the CDS portal, that some images show what appears to be a bright supernova which, given the size and nature of the galaxy, I would venture is likely to be a lensed image of a background event. It can be seen in a number of different thumbnails there: intriguing! Great stuff. Here is one I've identified at ~1.8 Gly by redshift (z 0.15), looking as if it's a trailing condensation in the outer arm of M77, although it's a little barred spiral photographically. 20" F/5 Newtonian, visual observation with a 13-mm ocular for the outer regions. Sky brightness 21.1 mag/arcsec2. Sketch in graphite. "E" are HII regions. I observed 2MASX J17222717+3207571 last night under poor conditions here in West Texas. We had unusually high humidity for the desert. The seeing was also sub par. I must say I found it rather difficult under these conditions. I finally found the right eyepiece combination for the conditions. My best view was with a 10MM ZAO @ 488X. I could hold the galaxy steady with AV and it appeared as a small round glow. It did appear larger in the eyepiece than on the POSS II image. Thanks for the heads up on this object. Nothing like catching light that has been traveling for 2.7 BLY from a galaxy!!!! AGC 2065's brightest member is V mag. 15.9 and only a few are brighter than 16.6, so seeing any galaxy in that cluster is a victory. I have not seen anything more distant, but now I have one to try.